A couple of years ago I became involved in a grand plan to make sounds out of LHC data. We called this project LHCsound. Recently we have revisited the idea with the aim of listening to real data produced in the proton-proton collisions happening right now, and I found myself back in my favourite place- talking to (okay, emailing) musicians with ideas for making this happen. It is my favourite place because the two-way conversations teach me to think differently about the numbers I look at every day on my laptop, and encourage me to to explain things without relying on jargon and terminology that only a tiny fraction of people have any hope of understanding. As much as I admire the people I work with, we all have in common that we chose to go into a fairly small and highly specialised area of “blue skies” research, and I have no doubt that communication with smart and creative people who made different choices can help us in our quest to find out how the physical world works. So I am writing a guide with the hope that posting parts of it here may generate criticism that will improve it. This example has numbers corresponding to a single (hypothetical) Higgs boson decay to a pair of Z bosons. Each row is a new “event”, that is, each row gives us information about a single Higgs decay. The numbers in the red rectangle are measured by the detector and the others are calculated using relativistic kinematics. I give a short description of what each of the columns represents at the bottom of this post. What do you do with these numbers? How do you turn them into sounds? The musicians I am working with now are using different methods, which all have in common that they “map” a number to some quality of sound. Every sound you hear can be described completely (and therefore reproduced exactly) by a set of parameters: volume, timbre, duration, pitch, direction. The way we choose to map the different numbers in this dorky printout I have kindly decided to inflict on you is arbitrary- we can choose any one of those columns to be volume and we can say that even numbers mean loud and odd numbers mean quiet, or we can say that prime numbers are the only ones we can hear, or whatever: arbitrary. But sonification doesn’t just mean turning numbers into sound. We want to make a sound that has some information in it, and that is where my musical colleagues weave their magic. This is why I am making an effort to make the “information” digestible: what meaning is there in these numbers? “Accurately described only by the theory of relativity“. “The branch of mechanics concerned with the motion of objects without reference to the forces which cause the motion“. That’s fine, but to me kinematics means energy, mass, momentum. We can’t see the particles moving, they are too quick, but we can infer how fast they were going and in what direction by looking at the mess they leave in the detector. When we accelerate protons with the LHC, we start off with them at rest in a canister of Hydrogen gas. We separate the protons from the electrons (a Hydrogen atom is one electron and one proton, bound together), and there they are at rest. There is a wonderful video by Chris Mann showing exactly how this works. I give the youTube link here to save you the special experience of navigating the webpages that we affectionately call the CERN Document Server. At this point, the equation we all know and love, E=mc², is valid. This means that the energy (E) and mass (m) of the proton are equivalent. We can drop the c² because it is a universal constant- it never changes. But E=m (dropping the c²) is not true for things that are not sitting still. Take light- the particle of light is a photon, which has no mass, so is the energy of a photon zero? Definitely not. Just feel the sun on your back, warming you. Photons have energy. The full story is not E=m, but E= γm*. This thing γ we pronounce “gamma”. This “full story” is always true, but for a particle that is not moving, γ is equal to 1, and in fact it is close to 1 at all times except when the particle is going almost as quickly as the speed of light- then it gets very,very big. If any particle with a rest mass m that is not zero (i.e. anything other than a photon) were to reach light speed, its relativistic mass, γm, would become infinite. This is not possible: the speed of light is a fundamental limit, a law, and only massless photons can reach light speed. At the LHC we accelerate protons to nearly the speed of light, so their relativistic mass is very large when we collide them together. That’s why we can make interesting stuff in the collisions. We can write down Einstein’s equation E= γm in a slightly less compact but more practically helpful form: E²= m² + p². This looks different, but means exactly the same thing. The E and m mean the same as before, but now we have p: the momentum of the particle. Only moving particles have momentum, so if we ignore the p² bit on the grounds that is zero, we get back to the rest mass equation E=m. We favour the form E²= m² + p² over E=γm because we can directly measure both E and p with our detectors, and therefore work out m, the invariant mass, which is interesting because it is a unique fixed number for each different kind of particle, and it tells us many things about the particle. The Higgs boson has a unique rest mass, which is what we want to measure, and energy and momentum. When the Higgs decays to a pair of Z bosons (why it decays is for next time) the energy (mass and momentum) is transferred to its daughters: the Z bosons. We take Einstein’s equation for moving things: E²= m² + p², and turn it around: m²= E² – p². The rest mass of the Higgs boson (m) can be measured if we can find its energy and its momentum. 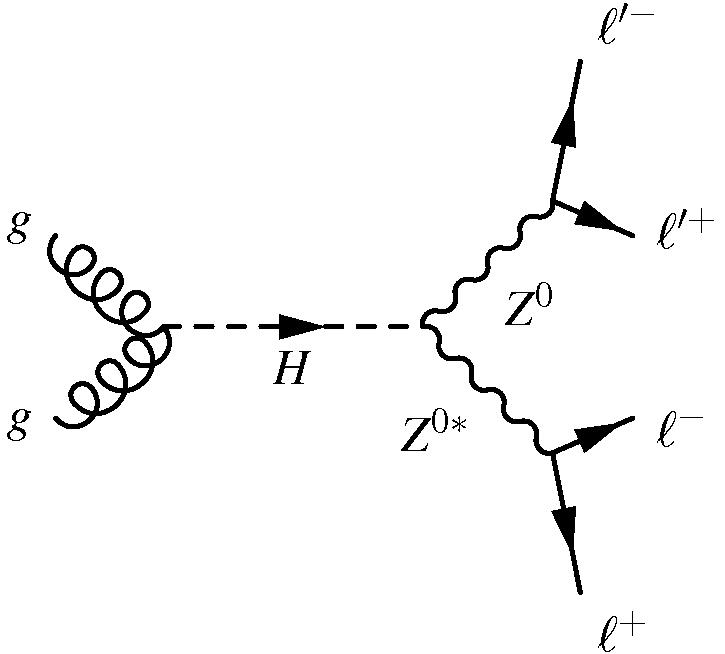 A Feynman diagram of a Higgs boson decaying to a real and virtual Z boson, where they in turn each decay to leptons with opposite charge. What we actually measure in our detectors is the energy and momentum of the stable (non-decaying) particles that the Higgs produces. In this case (illustrated above) electrons and muons (leptons, labelled as “l+ and l-” in the picture). The leptons we measure are therefore the four grand-daughters of the Higgs boson. We add up the energy of leptons 1 and 2 (E1+E2) and their momenta (p1+p2), to get the energy and momentum of the first Z boson (EZ1 and pZ1). We do the same with two other leptons to get the other Z boson, and then we add up the energy of these two Z bosons EZ1 +EZ2 and their momenta pZ1+pZ2 to get the energy and momentum of the Higgs, which in turn gives us the mass of the Higgs boson using m²= E² – p². Voila. * In fact telling you that E=γm is not particularly helpful in the case of the photon, which always has m=0 and γ=∞… sorry. This entry was posted in Arts, Particle Physics, Physics, Science and tagged audio, music, Relativity. Bookmark the permalink.